This dish looks and is very simple but Ive learnt a few tricks that make it that little bit special! Firstly get your hands on some ciabatta bread, I like to use the indiviual ones. Cut in half length ways and drizzle all sides with olive oil. Heat up a griddle pan until smoking hot and place the ciabatta soft side up straight onto the bars. 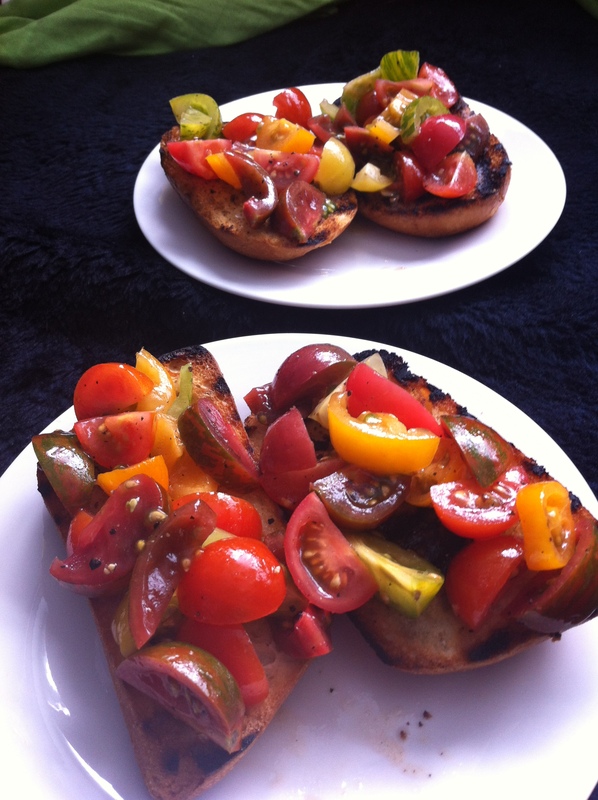 Whilst ciabatta is toasting, cut tomatoes into various shapes, (i like it to look quite rustic!) and place in a bowl, add, a few chopped basil leaves, a drizzle of olive oil and season with salt and pepper to taste. Set aside. If using standard salad tomatoes my advice would be to peel them, to do this boil the kettle and score the underside of the tomaotes with a cross (not the end that attactched to the vine) place in a bowl and cover them in boiling water, leave for 2-4 mins then blast them in cold water to stop the cooking process. Now the outer skin should just peel straight off. Keep an eye on the ciabatta turning once, you want nice bar marks on the bread but be careful not to burn it! Once ciabatta is toasted on both sides take off the heat. Take a garlic clove, cut the end off and rub the garlic over the hot toasted bread, this makes the world of difference and I NEVER leave this step out! Finally spoon over the tomatoes and drizzle and juices and oil left over in the bowl over the bruschetta. As I said this is a very simple dish to create and its what I love to eat as a snack, if your as mad on garlic as I am then you can crush half a clove directly into the tomatoes when seasoning for an extra garlicky hit!